I use raised beds in my market garden to provide early soil warming and to protect against flood. Here's a raised bed garden plan that can be adapted to grow a variety of crops. I plan my garden in 50-foot sections; note that you can further subdivide each section into two 25-foot or three 16-foot beds, if that suits your plans. We chose this size partly for ease of movement around the garden (you only have to walk a maximum of 25 feet to find a cross path), and partly because we use a lot of 50-foot soaker hose for irrigation. Having a consistent size of beds makes crop planning easier, too. I know how many of each crop will fit in my beds; if I need to plant 200 cabbages and I know that 100 will fit in a bed, then I can calculate how many beds I will need. I leave lots of path area to make it easier to move around the garden. Each bed has a path that's about 16" wide; I put wider paths between 50-foot sections, so I can bring equipment in a out. And my raised bed garden plan also allows for a 'road' right done the middle so I can use my truck to bring bigger equipment in and out. My raised beds are oriented north-south. This orientation helps make sure that each bed gets adequate sunlight throughout the day. My beds are made with a mechanical bed shaper on a tractor; the whole garden can be tilled and shaped in a day. On tilled ground, mark the line of the bed with string and sticks. We use a string slightly longer than 50 feet, tied to 2 step-in electric fence posts. If you are using a wooden frame, place the frames in line with the string, at one end of where you want the beds to start. Rake soil up from one side of the bed into the centre of the frames, then from the other side. Add any soil amendments - e.g. compost, organic minerals - and rake in lightly. Level the seed bed with your rake; if you are using a mulch film, make sure you install your drip hose under the mulch. My current garden is just over an acre, and has more than 200 beds that are each about 150 square feet in size. But if you have a smaller area to work with, here's a raised bed garden plan that will work for a big home garden or a small commercial garden. Laying out the garden. The total bed area is 5,000 sq ft, consisting of 100 beds each 50 sq ft in size (I'm ignoring path area to make this simple.) As a suggestion, you could lay out 50-ft x 2ft beds, then sub-divide them. This would let you use 50-ft soaker hose. The beds are oriented north-south, or as close as you can come. Being off by even 25-30 degrees will not seriously affect your garden. The crop plan for your mini-market garden: this table presents a list of possible crops for your garden, and the basic information you need to get started. The table above is based on 1) the popularity of various garden vegetables; 2) the space required to grow each crop; and 3) the timing to start and replant each crop to sustain a harvest over an entire season. 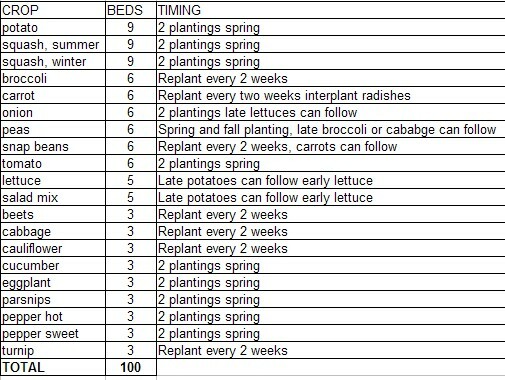 The table shows 20 market garden crops that are popular in my area; you should adapt this list to suit your own market. Note also that you can easily add crops with out adding space by inter-planting - e.g. planting radishes with your carrots - or by succession planting - like in the example above with late potatoes following early lettuce.